Florence Fay School Senior Apartments is the renovation of an iconic school building to meet a need for senior housing in an aging neighborhood. 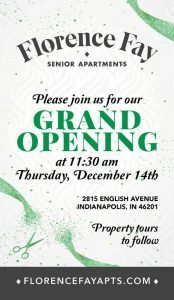 Located in the Twin Aire neighborhood in Indianapolis, the development will serve area seniors through the creation of 73 units of quality affordable housing in a centralized location. The rehabilitation will convert the vacant IPS Florence Fay School No. 21 into housing through the creative reuse of the 65,203 square foot school along with 24,557 square feet of new construction. One hundred percent of the 73 units will be low income, handicapped accessible or adaptable, and serve seniors aged 55 and better. Built in 1913, School No. 21 was named after Florence Fay, who lived from 1853 – 1912. Florence was a beloved teacher and principal, but her biggest impact was made in her pioneering efforts that brought civic improvements such as sidewalks, street lights, and running water to the previous school building and “suburban” neighborhood.